Great Rissington in the Cotswolds, like almost every village and town in the country, waved goodbye to many of its men as they marched off to war. And like the other towns and villages, not all of them would return. 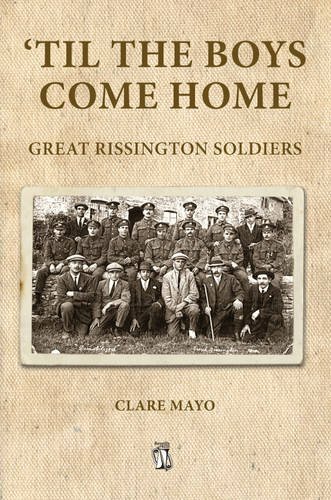 In Till the Boys Come Home Clare Mayo provides biographies of 38 of the men from the village who served, including 12 who were killed, five from just one family. Brief chapters also cover enlistment, training, the frontline, demobilisation, and local commemoration. Presented alphabetically, the biographies utilise available sources such as service records, battalion war diaries, and local newspaper articles. The experiences of the men overseas are illustrated through the judicious use of the war diaries. For the men who survived a selection of entries are used; for those who died the war diary entries for the day in question naturally make poignant reading. A number of pictures of the men are included, along with other relevant pictures of local interest. The book is rounded off with a brief but eloquent foreword courtesy of First World War historian Jeremy Banning. The author has personally visited every cemetery and memorial in France and Flanders where the men are commemorated, and the book has obviously been a very personal project. Suffice to say it is a fitting tribute to the men who served.